The key electrical design factor is the physical separation between energized and or grounded parts. If the distance between energized conductors or between an energized conductor and grounded hardware is less than that of the head-to-foot or wrist-to-wrist (flesh-to-flesh) distance of a bird (the wrist is the joint toward the middle of the leading edge of a bird’s wing; the skin covering the wrist is the outermost fleshy part on the wing). 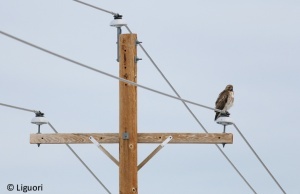 Because a bird’s feathers provide insulation when dry, contact must typically be made with fleshy parts, such as the skin, feet, or bill, for electrocution to occur. 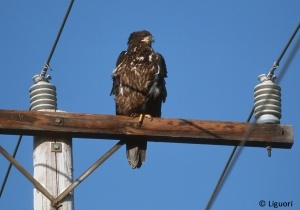 Consequently, most electrocutions are of large birds, such as eagles, hawks, and ravens. Framing structures so that there is adequate separation between phases or phases and grounds to accommodate large perching birds. 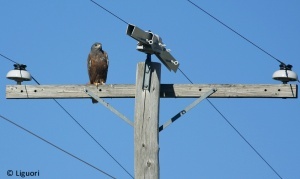 Based on the dimensions of eagles, APLIC recommends 60 inches of horizontal separation and 40 inches of vertical separation. Applying covers on phases or grounds where adequate separation is not feasible. Examples of covers include insulator/conductor covers, bushing covers, arrester covers, cutout covers, and jumper wire covers. Cover designs should be evaluated and approved by company engineers prior to use. (Note: bird/animal protection covers are not intended for human protection).